A BEAUTIFUL COMPLEX With LOVELY GARDENS, 3 BEDROOMS (6 Beds + Cot + High Chair) EN-SUITE, POOLS,TENNIS,SPA,SAUNA,.3 MINS WALK TO BEACH. BOOK NOW . Some of the attractions & activities in Almerimar area. Almerimar is the perfect location for both the family and couples, it also gives direct access into the Sierra Nevada where within an hour you can be in the heart of the mountains and in November to the beginning of March you could literally be Skiing in the morning and on the beach for the afternoon. Great location for a golf break - and maybe skiing too! Experienced golfers consider this area Andalucia. Extremely well off for golf, Almerimar Golf Course, the oldest in the area (25 years), was designed by Gary Player. Its 18 holes are fun and challenging. It's 1 kilometre from Laguna and has good club house/pro's shop facilities. A further 9 holes opened during 2005. Within 20 minutes drive are two other courses. La Envia, a stunning course, built in a mountain basin surrounded by sophisticated houses and a new 5 star hotel. Playa Serena at Roquetas de Mar is a good quality holiday golf course. About an hour's drive away - straight along the excellent fast motorway - are 3 further excellent courses - Valle del Este, Desert Springs and Mojacar Marina - all offering top quality golf. 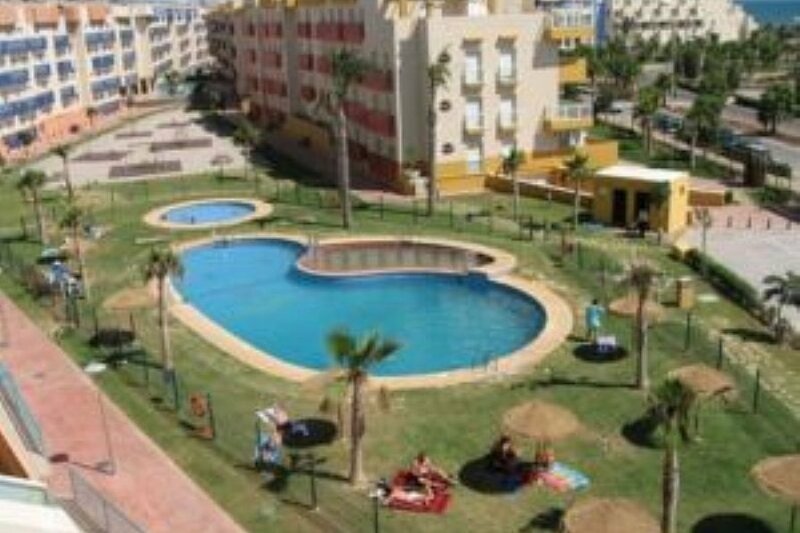 Almerimar is only 1.5 hour's drive from the famous Sierra Nevada ski resort - straight along fast un-crowded motorways. The skiing complex is large with a wide variety of excellent ski runs, from challenging blacks to simpler nursery slopes. There are a large number of cable cars and tow bars, with excellent catering in the ski village and at the top of the mountain. It's perfectly feasible to spend a morning skiing and the afternoon sunbathing on the beach! Laguna beach apartments offers 2 outside swimming pools with 1 children’s pool & Play Park, tennis courts. The communal gardens are landscaped with palm trees, plants and flowers. There is a resident car park situated under buildings with lift service to the apartment floor. The property is gated with good security. Almerimar Marina with berths for over 1000 yachts, Almerimar marina is one of the largest on the southern coast of Spain. The marina area is the focus for all the local shops and the supermarket. There are also banks, car rental and shops. There are also a wide variety of restaurants from good value tasty Spanish Tapas, Chinese, Italian & English to gourmet seafood served overlooking the marina. Unknown to most people, the ancient Andalusian province of Almeria, with its 200 miles of virtually undeveloped coastline, lies in the south-east corner of Spain, less than 100 miles from the coast of North Africa. Enjoying the warmest and sunniest climate in the whole of Europe, with mid-day temperatures in January averaging 69°F and in July and August 99°F at least, and with the sun shining for more than 320 days in the year. This historic "forgotten province" is slowly awakening to the possibilities of tourism, bringing in amenities and facilities for Holidaymakers, whilst still remaining one of the most charming and unspoilt regions in Southern Spain. The city of Almeria is located at the foot of a mountain range, which is crowned by the magnificent Alcazaba, an Arab fortress built by the Calph of Cordoba, Abd-er Rahman 111 with three huge walled enclosures. Also interesting is the Almeria Cathedral, a fortified cathedral, which was built in the 1500´s when pirates terrorized this part of the coastline. Is a very popular resort set against the mountain backdrop with a fine, un-crowded beach stretching for many miles? Although modern, it still preserves its classic Spanish charm and authentic atmosphere. With many excellent restaurants serving mouth watering Spanish specialities, as well as lively bars, shops and a bustling fishing harbour, Roquetas has something for everyone including children. The city of Granada and the famous Alhambra Palace can be seen in a day’s trip. The Alpujarras valley, with it’s charming villages. The famous cave houses at Guadix on the Granada Road. The prehistoric caves at Nerja with fantastic calcium stalagmite & stalagtite formations on the Malaga road about 45mins drive. Mini Hollywood - visit the Tabernas Desert, home of the Spaghetti Westerns and famous for films such as ‘The good, the bad and the ugly’ and many others. Cabo de Gata Nature Park - This natural park is the largest coastal nature reserve in Andalucia. There are many hidden coves and lovely white sand beaches. The clear waters of the peninsula are perfect for underwater photography, sailing and windsurfing. Scuba diving is also arranged at the marina. It has a total of 200 kilometres of coast with long, un-crowded stretches, sheltered coves and the rugged wilderness of Spain's South Eastern cape. Large supermarket near the marina - Mercadona. Hypermarket in the Centro Commercial – Copo. Large supermarket in Grand Plaza, Roquestas - Euroski. There is a market on Sundays at the side of the Marina. El-Ejido has a market every Wednesday morning. The bus stops at the entrance to the market. The market provides an extensive range of products – fresh fruit/vegetables, cooked chickens (roasting as you watch), clothes, shoes, paintings, bed linen, material, towels and so on. Sailing, water skiing, boat hire, wind surfing, fishing, walking, cycling, golf, horse riding, scuba diving The Water park at Roquetas de Mar. Winter skiing at Sol y Nieve in the Sierra Nevada. The new Aquarium at Roquetas De Mar. Pink flamingo’s live in the reserve of Punta Entinas–Sabinar between Almerimar & Roquetas De Mar 15mins drive. You will see the many other bird species in the area ie: Stilts, Buzzards, various hawks. We do hope you enjoy your stay and hope you will revisit again soon. IT IS ADVISABLE TO RENT A CAR AS YOU WILL NEED ONE TO VISIT ALL THE LOCATIONS IN THE AREA. SHOULD YOU ONLY WISH TO STAY IN THE LOCAL AREA ABOUT 3-5 MILES AND YOU LIKE TO WALK THIS WOULD SUITE YOU WITHOUT DRIVING,YOU CAN GET TAXIS AT THE AIRPORT FOR ABOUT 50EU EA WAY.A BUS IS ALSO AVAILABLE BUT WOULD BE MORE IN TIME / HASSELL. YOU CAN ALSO HIRE BICYCLES AT THE MARINA IT TAKES ABOUT 10MINS TO CYCLE FROM THE APT TO THE MARINA DOWN THE PROMANADE. IT IS QUITE & BEAUTIFULL,WITH LIFE AT THE MARINA IF REQUIRED BUT NOT OVER BUSY EXCEPT MAY- SEPT. IT HAS PLENTY OF AREAS TO CYCLE & WALK IN. RELAXING BY THE POOLS OR IN THE GARDENS IS A GOOD TIME TO SPEND IN THE SUN.